Louis Arzo 'Gearshifter' Youngblood (1)Louis Youngblood was born on Valentines Day 1953 in Picayune, Miss; and grew up, for the most part, in Tylertown. 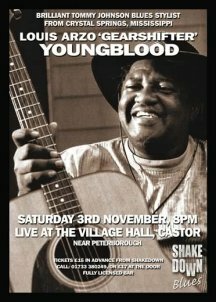 His mother, Essie Mae, was a guitarist and singer of some note as was his grandfather, Arzo Youngblood. Both of them were heavily and directly influenced and taught by the renowned Tommy Johnson who was married to Essie Mae�s sister Rosa in the 30�s. Louis in turn was taught to play and sing by his mother and so indirectly picked up on Johnson�s style and still features songs by him today. At this time Scott Barretta ex - Living Blues editor, heard him play and was so impressed that he produced a small � ragged but real � demo CD that contained a wonderful eclectic mix of pre-war and post-war blues together with soul blues classics that included a brilliantly humorous rendition of the salacious �Bang Bang on the Headboard�. On the back of this an intrepid Italian promoter booked him together with our old friend Terry Bean for a �Pasta and Blues festival�. At the same time we were in touch with Scott hoping to book Gearshifter for a Shakedown gig only to find that on his return from Italy he had been diagnosed with health problems that made flying impossible. Since then we have been in regular contact with Louis and have been following his recuperation closely. When we met Roger Stoller of Cat House Records at the George Brock concert in June he told us that Louis was playing regularly again and was looking and sounding fit and well. A �phone call with Louis confirmed this and he was happy to fly out at the beginning of November for a Shakedown date. �Been a long time coming� but will be all the better for the wait. Background listening: Tommy Johnson Route LP 330 �Complete 1928 Victor Recordings� incl; Maggie Campbell Blues, Big Road Blues, Cool Water Blues and Canned Heat Blues � and, before you ask, yes this is where they got the name!